Preheat oven at 325 degrees F. Place ham on rack in roasting pan; bake for 1 1/2 hours, or until ham reaches its internal temperature of 135 degrees F.
Mix honey, mustard, and ground cloves in small bowl; remove ham from oven; cut off any rind and all but a thin layer of fat. Using a long knife, score fat in a 1-inch wide diamond pattern; press 1 whole clove into center of each diamond and brush generously with some of the honey glaze; bake ham for another 15 minutes. Using toothpicks, attach slices of pineapple to the ham; brush pineapple all over with glaze; bake for 20 minutes longer; brush again with glaze. 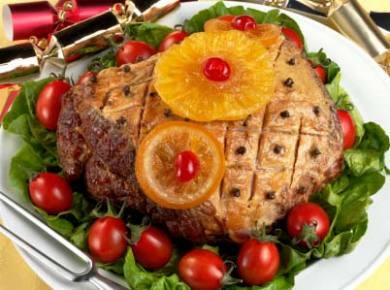 Transfer ham to a platter and remove pineapple slices; arrange slices alongside the ham. May also use brown sugar instead of honey, just pat it on thickly into the mustard.